PhD students are often more interested in driving change by contributing their knowledge and understanding in some of the following ways: conducting research that reshapes their field of expertise, altering political agendas or simply training the next generation of teachers to approach their craft from a new angle. Secondary emphasis areas normally consist of 12 semester hours of credit. The secondary emphasis area of study provides an opportunity for advanced, intensive, and purposeful study in a particular specialty or a coherent interdisciplinary field of study. Accordingly, the requirements for the secondary emphasis area require rigorous inquiry and involvement in scholarly activities. Through this area of study, students may explore and become familiar with the analytical concepts and assumptions that distinguish a particular specialty from other areas of study. The student may also develop proficiency in the methods by which specialists develop and test knowledge. 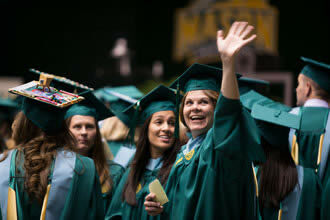 Students may select a secondary emphasis from any of the George Mason University departments or schools offering graduate programs in specific areas of study. The requirements for these secondary emphases are set and monitored by faculty in the administering department. A faculty member in the designated department serves as the student's secondary emphasis area advisor. Secondary emphasis areas may be selected from any of the academic specializations within the Graduate School of Education. However, the secondary emphasis must be in a different program area than the student's major area of study. The course requirements for these secondary emphasis areas are established by program area committees and monitored by individual faculty members. Generally, the course requirements for discipline-based secondary emphasis areas include work both within GSE and other Mason schools, departments, and institutes. A faculty member in the designated program area serves as the student's secondary emphasis area adviser. Secondary emphasis areas can be individually designed across GSE program areas and other Mason departments. Such secondary emphasis areas should include a coherent rationale for the choice of specific coursework which meets the student's professional goals. The requirements for these secondary emphasis areas must have the approval of a GSE faculty member who serves as the student's secondary emphasis area advisor. Students who have earned a master's degree in a discipline other than the major area of program specialization may request using the master's degree for a reduction in credit of nine credit hours of the GSE secondary emphasis area requirement. The master's degree must have been awarded within the last six years prior to admission to the doctoral program. Approval of such waivers and any additional requirements will be determined by the PhD in Education and Human Development Committee. A faculty member with expertise in the designated area should serve on the student's program advisory committee.